Microsoft announced on Wednesday a new workplace chat tool poised to take on industry darling Slack. The new service -- called Microsoft Teams -- will be a part of Office 365, which includes Microsoft Word, Excel and PowerPoint. Considering Office 365 has more than 85 million commercial monthly active users, the company is hoping to lure those core customers to the new platform. Teams is designed to make chatting with coworkers fun and easier. In addition to holding conversations in chat rooms, Microsoft (MSFT) users will be able to reply with comments in threaded conversations and video chat with others. There's also an option to send emoji, GIFs, custom memes and stickers via the platform, and connect your Twitter feed. The service has a heavy focus on bots, allowing users to ask for details about people on the team or chat directly with businesses. Partnerships range from Alaskan Airlines, to help book tickets, to startup Poncho, which gives weather and lifestyle updates like how bad allergies might be today. 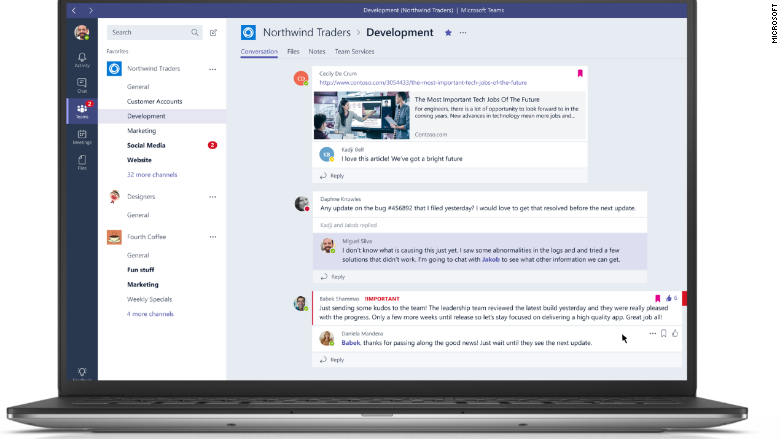 A look at Microsoft Teams. Teams will be available to Office 365 customers with certain plans, such as Business or Business Essentials. It's currently in preview across 181 countries in 18 languages and will roll out officially in early 2017. It will run on Windows, Mac, Android, iOS and web platforms. The service will directly compete with Slack, a popular workplace chat tool with more than 5.8 million weekly active users. The startup, whose customers include IBM (IBM), LinkedIn (LNKD) and Conde Nast, took out a full-page ad in The New York Times on Wednesday ahead of Microsoft's announcement. "Dear Microsoft... We're genuinely excited to have some competition," the ad said. "We realized a few years ago that the value of switching to Slack was so obvious and the advantages so overwhelming that every business would be using Slack, or "something just like it," within the decade. It's validating to see you've come around to the same way of thinking." Slack also offered "advice" for Microsoft, stating "all this is harder than it looks." 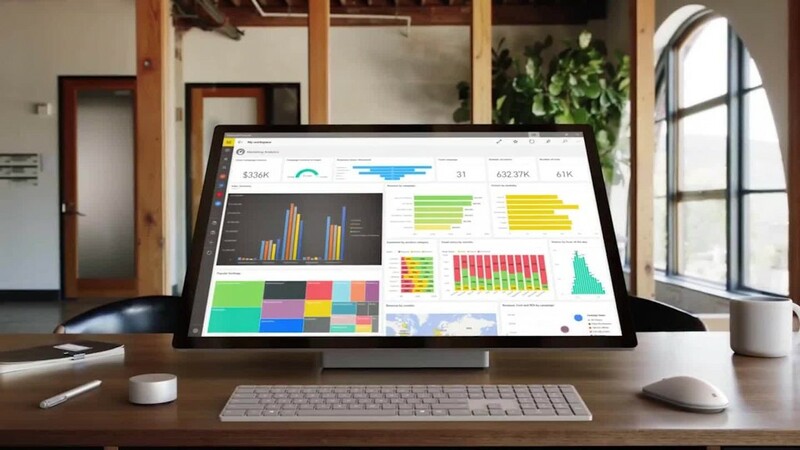 Microsoft's news comes one week after it showed off its first all-in-one Surface PC called Surface Studio ($2,999), which has a strong focus on creativity. The move highlighted the company's desire for users to start thinking of its products as more than just productivity tools. It also unveiled its next-generation Windows software -- called Windows 10 Creator Update -- that includes virtual reality, augmented reality and 3D support. But its latest effort into the workplace chat game is a part of a larger trend from tech companies. Last month, Facebook (FB) unveiled Workplace, which looks similar to its existing social network but is designed for employees to chat with one another. Users can visit online bulletin boards for their company to see announcements, organize events and watch work-related live streams. This isn't Microsoft's first shot at business-focused social networks. The company acquired Yammer for $1.8 billion dollars in 2012 and most recently bought LinkedIn for $26. 2 billion.